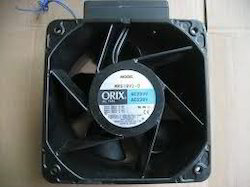 Supported ourselves with proficient amenities, we are readily engrossed in offering a comprehensive consignment of Oriental Cooling Fan. Its obtainability with us in different sizes and stipulations makes these highly valued. Not only have this, our capability to match with their urgent and bulk orders aided us in becoming us a favored market choice. ACE Automation is engaged in the business of Manufacturing, Trading and Supplying of Encoders and Digital Readouts, Programmable Logic Controllers, Variable Frequency Drives, Stepper Motors, Sensors For Automation Application, Servo and AC Motors, Vision Sensors, Level Control Sensors, Limit Switches, Hot Metal Sensors, Analog Displacement Sensors, Proximity Switches For High Temperature, Motorized Linear Slides, Cooling Fans, Water Supply and Drainage Control System, Electric Relays, Factory Automation Systems, Controlling Machine Tools, Controller Network Compatible Products and serving below industry sectors since its establishment in the year 1994. We have been providing Turnkey Solutions from CONCEPT to COMMISSIONING to all the above sectors. Engineers having diverse educational background like Instrumentation, Electrical, Electronics & Telecommunications, Industrial Electronics, Process etc.